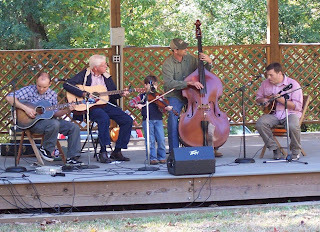 Mandolin and upright-bass music filled the air and reverberated off of the walls of Valley Creek at the annual Kenan's Mill Bluegrass Festival. As Rick Wilson introduced the musicians, one couldn't help noticing little Cody Bryant, a young fiddle prodigy, as he sawed his fiddle with a skill and ease that belied his age, leading the band through rousing bluegrass favorites. 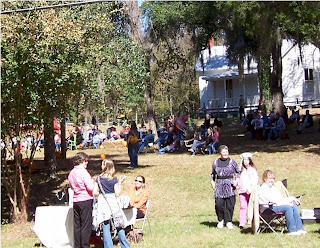 Arts and crafts were on display and for sale at the festival as well. 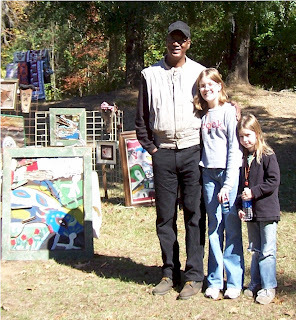 Here, the Tinman, Charlie Lucas, (left) best known for his metal sculptures of animals, poses with young fans Gloria and Ari. There were free amusements for children, such as a bounce-house and inflatable slides. 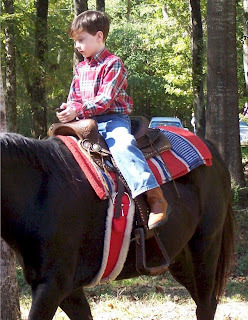 Horse and pony rides were available; fun names such as Eastwood and Tonto were among the names of horses ready to ride. There was also an old-timey tractor pulling children and family members around the grounds for hayrides. Festivities began at 9am and ended at 5pm.